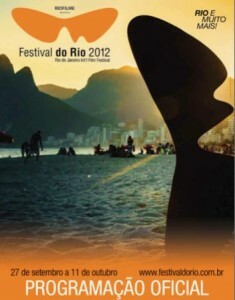 RIO DE JANEIRO, BRAZIL – The biggest film festival in South America, Festival do Rio 2012 (Rio International Film Festival), starts its 14th edition on Thursday, September 27th and will continue until October 11th. More than thirty venues will play over 400 films that showcase the best of contemporary Brazilian cinema as well as the brightest offerings of filmmakers from over sixty different countries. 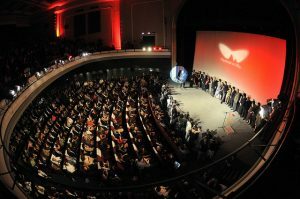 The 14th Rio Film Festival runs September 27th through October 11th, photo courtesy of Festival do Rio. Showing as one of more than seventy films that highlight Brazil’s rich culture and artistic visions through its increasingly powerful film industry, is Breno Silveira’s “Gonzaga – Father to Son” which will open the over two week long festival. It is a feature about the successes of and differences between Brazilian musician Luiz Gonzaga and his musician son, Gonzaguinha. Première Brasil, the competitive section of the festival for Brazilian cinema, will include twelve feature films, ten feature documentaries and a number of shorts with jury prizes presented at the end of the festival along with the coveted audience awards. All of the selections will be shown with English subtitles at Odeon Petrobras in Cinelândia, Centro. Birkbeck who also curates the Frontiers/Dox section of the festival suggested five films playing in the festival that she says are “absolutely unique”: Leos Carax’s “Holy Motors“(France), Anurag Kashyap’s “The Gangs of Wasseypur“(India), Carlos Reygadas’ “Post Tenebras Lux“(Mexico), Brian Knappenberger’s “We Are Legion: The Story of the Hacktivists” (USA) and Abdallah Omeish’s “The War Around Us” (USA). Festival goers at the opening of the 2010 festival at Odeon Petrobras, photo courtesy Festival do Rio. The festival will also feature special tributes to four directors: genre spanning American director, screenwriter, producer John Carpenter, Brazilian art editor, producer and once blacklisted director Alberto Cavalcanti and Portuguese directors Manoel de Oliveira and João Pedro Rodrigues. For the film industry insiders, there is RioMarket, a section of festival (running Sept. 28 – Oct. 9) that will feature seminars and workshops for and about the film industry. Audrey Fisher, costume designer for “True Blood” will host a workshop on October 5th and is one on many scheduled industry professionals for RioMarket this year. See their website for more information, scheduling and times.